Tuesday May 6th 1986: 41,722 fans including centerfieldmaz & his little brother came to Shea Stadium to see two undefeated pitchers go head to head. 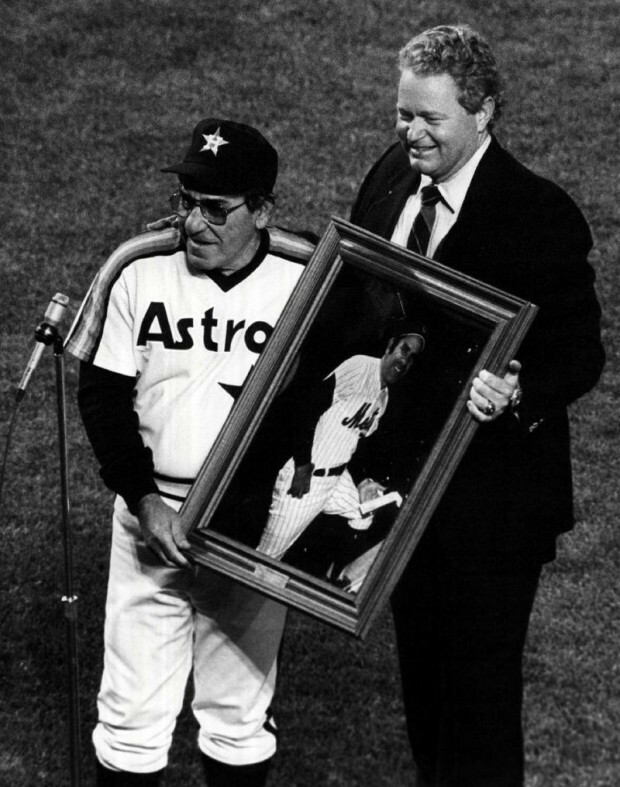 On this night the Mets celebrating their 25th season, honored former Met Manager Yogi Berra, who was now a coach with the Houston Astros. Berra served as a coach with Houston from 1986-1989. Rusty Staub presented him with a lithograph of himself from his managing days. Staub was a player under Berra (1972-1975) including the Mets 1973 NL Championship season. This was the first time Berra appeared at Shea since he was manager in 1975. The first place Mets (17-4) already running away with the division, had the reigning Cy Young Award winner- Dwight Gooden (4-0) on the mound. In those good old days, it was always a special night when Doc took the mound. His opponent was Bob Knepper, for the western division, first place Houston Astros. All signs were pointing to this being an early preview of that years NLCS, which it was. 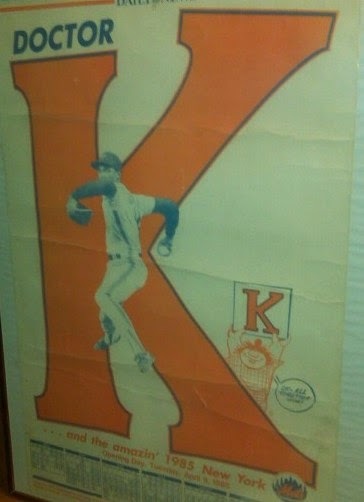 The two pitchers matched zeros along the way until the fifth inning, when the Mets George Foster, hit his first HR of the year. By this point Foster's days were numbered, he was target of the Shea Boo Birds & he was not the most popular guy in the dugout either. In the 7th, Foster led off the inning with a walk. Then what looked like a double play ball, became an error & short stop, Rafael Santana reached first base. The pitcher, Gooden then gave the crowd a huge thrill, as he tripled driving in both runs making it 3-0. Charlie Kerfield (who would get hammered by the Mets in the NLCS) was brought in to replace Knepper. Kerfield gave up a single to Kevin Mitchell scoring Gooden to make it 4-0. On the mound, Gooden didn't allow any hits until the 5th inning, when Glen Davis led off with a single. With two outs, Kevin Bass walked, giving the Astros two base runners, something they only had twice in the game. But Gooden got Terry Puhl to fly out. 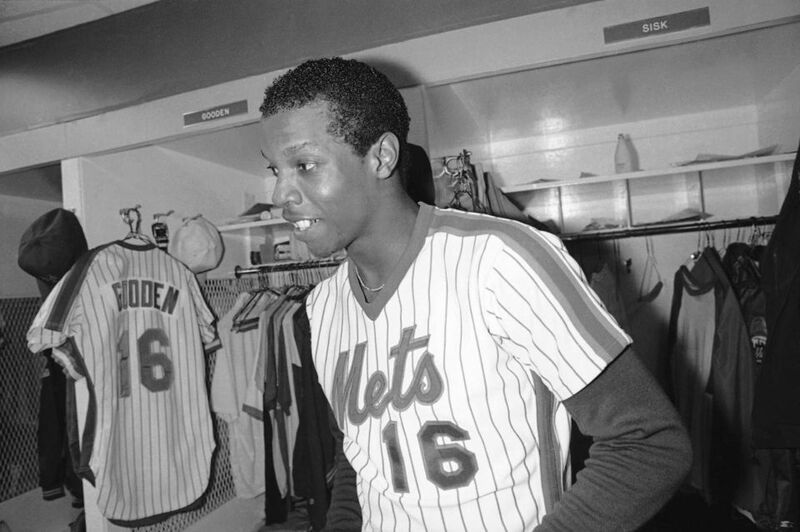 In the 9th, Gooden had the one hitter in tact & the fans were eager to close it out. But Gooden walked the lead off man, then after a ground out, Craig Reynolds singled for the Astros second hit of the night. Then Jose Cruz got aboard, when Tim Teufel booted the ball loading the bases. Gooden then got slugger, Glen Davis to ground into a double play, sealing the two hit shut out & besting his record to 5-0, lowering his ERA to a league best 1.04. On the night he struck out seven & walked two.